The honour of leading the Crows in their foundation years in the national competition went to an SANFL player who believed his opportunity to play at the highest level had passed. Chris McDermott had been a star in the SANFL through 264 games with Glenelg, played in premiership teams, won best-and-fairest trophies, All Australian selection, and led State-of-Origin teams. McDermott, 27 when the Adelaide Football was formed, played a huge role in the Club’s early days as it tried to pull together more than 60 players from all the SANFL clubs. 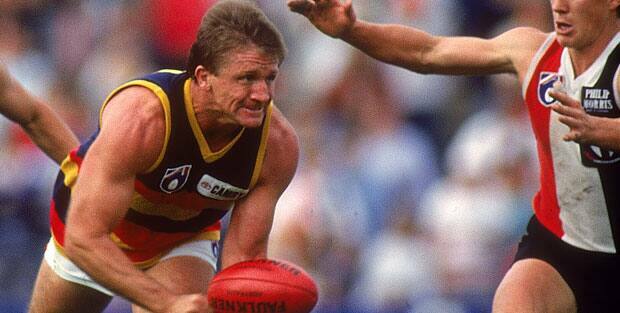 But the tough midfielder also proved he could play at the level, winning Adelaide’s 1992 Club Champion award. The 1982 Magarey Medallist left Glenelg in 1986 to join Footscray but returned to South Australia to join the new Adelaide Football Club at the end of 1990. He was vice-captain under McDermott in the first four seasons and was a consistent star, winning the Club Champion in 1993 and finishing runner-up in the other three seasons. McGuinness was elevated to captain when Robert Shaw took over as coach in 1995. 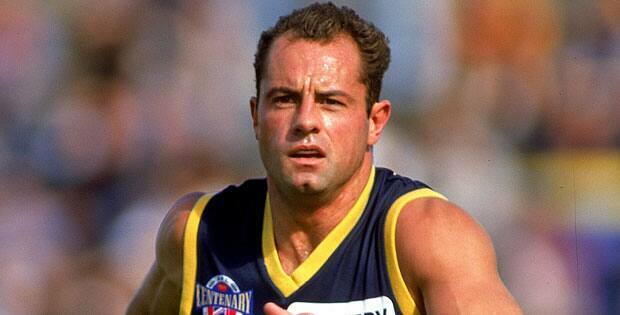 One of the last players signed by Adelaide to its foundation list, Mark Bickley quickly developed a reputation for courage, hard work and team values, winning best team man award in 1992 and ’93. Then in 1997-98, Bickley became “dual premiership captain” after his first two seasons in the captain’s role. He opted to step down as skipper at the end of 2000 but played on for another three seasons. Already ranked among the game’s elite, Mark Ricciuto took his game to another level after taking on the Crows captaincy. He won a Brownlow Medal in 2003, Club Champion awards in 2003-04 and was selected in four All Australian sides during his seven seasons in the role before injuries forced his retirement at the end of the 2007 season. Simon Goodwin was 32 when he replaced close mate Ricciuto as captain for the 2008 season but was still performing at a high level, having been an All Australian in 2005 and 2006 and following up consecutive Club Champion awards by being runner-up in 2007. He also won All Australian selection in 2009 but announced his retirement during the 2010 season and was unable to complete the year because of injuries. A member of the Crows leadership group since 2008, Nathan van Berlo was appointed captain ahead of Season 2011. 'VB' finished Runner Up in the Crows Club Champion award in his first season as skipper and played an integral part of Adelaide's finals assault the following year. The West Australian was a benchmark of professionalism on and off the field during his tenure, winning the Dr Brian Sando OAM Trophy in 2014 despite missing the entire season with an Achillies injury. He led the Crows in 66 games across four seasons before passing on the mantle to Taylor Walker in 2015.